The crop should be harvested when 95 percent of the pods have turned brown and seed in the pods are black. If harvesting is not done at this stage, seed quality will be reduced due to large quantities of harvested immature seed. 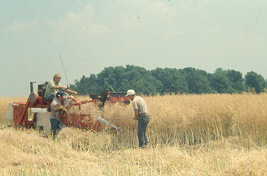 Harvesting should not begin until moisture is below 10 percent. Moisture meters are readily available from seed industry equipment suppliers. Note that an early freeze can prevent maturation, resulting in a price drop. Canola can be easily harvested with any combine used for small grains. Most current combine manuals include instruction for canola or rapeseed. Cylinder speed should be about 450 to 600 rpm, with wide concave clearance such as ¾ inch. Running the combine full with partial wind and sieve openings allows more rapid travel. Good combine setup will allow some pod ends to come into the bin. A very clean sample likely means some good seed is being blown out the back of the combine. Plug minor leaks on the combine with silicone sealant or duct tape. Due to heavy amounts of material run through the combine belts must be kept tight for best performance. A combine harvest speed of 2-½ mph is recommended so that clean seed results. Although spring canola can be direct-combined, better results are achieved by cutting and swathing after the crop reaches physical maturity. Allow the crop to dry in the windrow (swath) and combine at about 9 to 10 percent moisture. This corresponds to when about 30 to 40 percent of the seed color change on the main stem (only) has occurred. The swath should be no more than seven feet in width to ensure that adequate curing occurs. This will minimize the amount of green materials that might otherwise clog the combine. 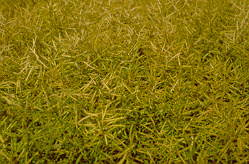 Swathing too early will result in green seeds, lower oil content and higher seed moisture. Swathing too late will result in excessive shattering. Seed moisture should not exceed 8 percent for long term storage. Lining the floor with a fine nylon or metal mesh screen will solve the bin linkage problems. When drying seed, temperatures above 104 °F can change the seed oil composition and reduce/eliminate the germination potential. Seed stored below 6 percent moisture is susceptible to damage in handling.